I do mean that this is unusual in that most drugs lose, or at least appear to lose, their effect over time (it’s a little more complicated than this but I’ll save my explanation of this statement for next week or something). I also presented data showing that this is actually absolutely not the case, that EC clearly not only continues working in the long-term but, for some reason, becomes more effective over time. And this goes against what is most commonly believed about not only EC (with claims that it stops working, usually based on the fact that the side effects are no longer felt) but with almost all dieting drugs (including the big pharmaceutical ones). This is true whether they work through metabolic effects (i.e. by increasing energy expenditure) or decreasing appetite (as most pharmaceutical drugs to date have done). Most seem to generate about a 10% weight loss and that’s it. They “stop working”. Or do they? And the answer, in my opinion is no. Rather, the perceived loss of effect is for a different reason. And that reason is how the body adapts to dieting. We know that with dieting/fat loss, there are adaptations that occur in all aspects of the energy balance equation. There is an increase in hunger and appetite along with increased enjoyment of highly rewarding foods (highly palatable, high-calorie, high-fat, high-sugar foods). There is even an increased noticing and attention to those foods that occurs. All aspects of energy expenditure go down as well. Resting metabolic rate (RMR) drops due to both the loss of bodyweight and an adaptive component. The thermic effect of food (TEF) goes down due to less food being eaten but there doesn’t appear to be any other major effect. The thermic effect of activity (TEA) goes down due to the reduction in bodyweight along with an increase in efficiency within skeletal muscle (the body burns less calories at any given energy expenditure); this can be compensated for by increasing the volume or intensity of exercise. Finally there is Non-Exercise Activity Thermogenesis (NEAT) with limited work showing that it decreases on a diet. And the end result of this is that the person is at least driven to eat more food (which can in premise be controlled) and their total daily energy expenditure (TDEE) decreases. And it’s these effects, rather than the drug losing it’s effectiveness that causes both the plateau in weight loss along with an apparent loss of effect. Let me explain this a little bit better. Let’s say that you start a diet and everything is normal whatever that means. Your metabolic rate is 100% of the predicted level and your hunger, appetite, etc. are all normal. Let’s say that you add in the EC stack. You get a boost of about 10% over normal metabolic rate (so your energy expenditure is actually 110% of the predicted level). Fat loss actually happens more quickly than would be predicted. The diet is flying along and you’ll be ripped in no time. And say that 6 weeks later (number chosen for illustration), your total energy expenditure has dropped by 10%. 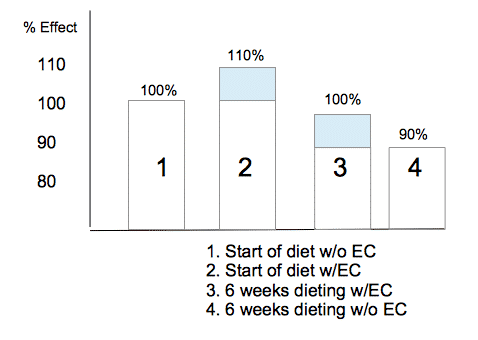 Now you are only at 100% of your predicted maintenance level and fat loss should be close to the predicted values. But it’s not because the EC stopped working; it’s still generating it’s 10% increase in energy expenditure. This is simply offset by the body’s adaptation. But imagine if you stopped taking the EC. Now your energy expenditure is 90% of what it was. The adjustment your body made is unchanged but now you’ve taken out the EC. And you’re in a much worse spot because now you’re fighting the body’s normal adaptations to dieting. Effectively, EC seems to stop working because it goes from being an addition to a normal metabolic rate to being a replacement. The same holds for other drugs, I’d mention. Take anabolic steroids and they eventually shut down your body’s production (adaptation). They go from being an addition to your normal levels to a replacement. Thyroid works the same. Take thyroid medication and it eventually shuts down your body’s production. What was an addition to normal becomes a replacement. But the steroids and thyroid are still having the same effect as before. Your body’s adaptation simply cancels it out. The same will hold conceptually for any dieting drugs. They don’t stop working, the body simply adapts to the process of fat loss which ends up cancelling them out. I’ve shown this graphically below comparing a diet without any drug, a diet with the drug (blue box taking the person to 110%), later in the diet with the drug (the person is at 100%) and later in the diet without the drug (the person is screwed). The blue box is the same size in both 2 and 3. The drug is having the same effect and is working just as effectively as when you started. It’s the shrinking part of the white box that makes it seem like it’s not working. Does this make sense? Put more concretely in the context above, after adaptation EC is still generating a thermogenic effect, it’s not felt as much because the body has lowered energy expenditure; without it, energy expenditure would be even lower. Appetite suppressants are still suppressing appetite to one degree or another, it’s not felt and someone would be hungrier without them. Even paying attention the thermogenic (temperature increasing effect), the drug is still generating it. Temperature is no longer elevated above normal but the person would be colder without it. I think you get the idea but this raises the question of why this is happening. So the body adapts to dieting, as we’ve known for decades and I have written about nearly decades and this would seem to suggest that the issue here is that the drug doesn’t stop working, the body’s adaptations cancels it out. And the above is all wonderful in theory (though the direct data on EC’s effects are measured and established) but what about some more direct data. Here, once again, I talk about leptin. Leptin is a hormone predominantly released from fat cells that effectively tells the brain two things: how much fat you are carrying and how much you’re eating (trivia for the day, women produce more leptin per unit body fat than men and their brains respond differently to it). Cut calories and leptin can drop by half in a week (more in women); clearly you haven’t lost 50% of your body fat. Over the next block of dieting, leptin drops more slowly as fat is lost. And this sends a big part of the overall signal to the brain to slow metabolism, increase hunger, increase the rewarding nature of foods, etc. This has been shown very directly in some small studies where, after being dieted down to about 10% below normal, they were infused with leptin to restore levels to normal. And this completely reversed the adaptations to dieting. Thyroid levels came up, metabolic rate came up, and more fat was lost. This was in humans by the way. And here is why this is relevant to what I’m arguing. Administration of L with S synergistically decreased FI and increased weight loss and fractional fat loss. A reduction in plasma L concentration may contribute to the “plateau phenomenon” observed in studies of weight loss therapies. Replacement doses of L during S administration increased weight loss and fractional fat loss by (1) decreasing food intake and (2) by increasing fat oxidation. Such drug combinations may be useful in the treatment of human obesity. Again, this is in animals but given the studies where leptin replacement reversed the metabolic adaptation in humans, I see no reason why the same mechanism isn’t at work here. 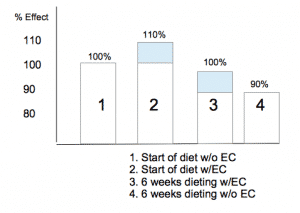 The drop in leptin coordinates the adaptive response to dieting which would be offsetting the metabolic effects of the EC stack or any other dieting drug which makes it appear as if the drug has stopped working which it hasn’t. Reversing that reverses the adaptations to dieting and keeps the drug working longer and more effectively (at least in animals) than it otherwise would. But since the proper use of leptin (to keep diets working more effectively rather than causing weight loss) never really got adequately researched and leptin never got out of the clinical use stages, this was never tested in humans so far as I can tell. Which is exactly what I’m saying here. I should probably at least try to provide some sort of practical implications for this. Here I’m focusing only on the EC stack but it would really hold for any compound working like this. Because there are kind of a few ways you can apply the above in terms of how you might choose to use the stack in conjunction with a diet. The first would be to put EC in right at the start of the diet. Fat loss is accelerated since you’re boosting metabolic rate over normal. The appetite suppressant effects of EC tend to be most potent although it’s debatable if this is necessary at the start of a diet. The second would be to wait until the body starts to adapt. This might be 6-8 weeks into the diet (and could be tracked by measuring mornin body temperature or just noticing slowed fat loss). Put in the EC stack here to get metabolic rate back to the pre-diet level to keep fat loss moving. The appetite suppressant effects would be arguably more useful here. As a third option, you could conceivably finish your diet without the use of any EC and then plug it in when the goal is maintenance. This will both offset the diet induced adaptations as well as providing the most pronounced appetite suppression effect. In addition to being able to raise calories to maintenance (meaning more food intake), and the ability to increase exercise (due to more calories coming in), this would give the best of all worlds to limit the fat regains that the body is primed for. Note: when the appetite suppressant effects of EC wear off, adding 1-3 grams of the amino acid L-tyrosine (which is a precursor to the catecholamines, dopamine, adrenaline and noradrenaline) can reactivate them. Thermogenic drugs such as EC or even other diet drugs don’t really stop working in the sense that the body stops responding to them. They are still working fine, their effects are just cancelled out by the body’s adaptations. If the drugs weren’t being used, the person would be in an even worse situation since the adaptations that have occurred are not offset at all.